Word couldn’t have come at a better time! During a major sales presentation, all eight of our cell phones lit up with the news. Ragan’s PR Daily awards Gregory FCA two big wins in its best of PR competition for 2013. 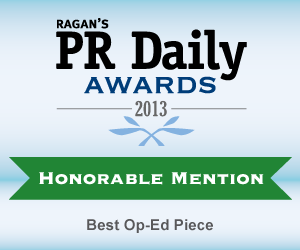 And the categories couldn’t be more illustrative of our market position as a top national PR firm. By winning both the Best Traditional News Release of the year and the Best Content Marketing/Brand Journalism honors for 2013, we were able to showcase the complete breadth of our service offerings, from old-school news release writing to leading-edge techniques for executing contemporary PR campaigns that draw upon next-generation content marketing practices for brand journalism. We’re honored by the recognition and grateful for clients nationwide who prize our skills and experience, and also give us the leeway to advance the latest, contemporary strategies for public relations and communications. Ironically, the awards also recognize one of our newest clients and one of our longest tenured clients. For Best Traditional News Release, we won for work with CAST Software, a software analysis and measurement provider. And Yoh, the Philadelphia-based talent management company, provided us the collaboration that allowed for the win for the year’s Best Content Marketing/Brand Journalism campaign. As for myself, I am constantly awed by the talented people here at Gregory FCA, and their willingness to master the new, take risks, and develop their craft. These awards only serve to highlight my complete and utter confidence in them, their abilities, and their vision for the future of public relations. Five years ago, we made a strategic decision at Gregory FCA to not stay the course and continue down the tired, well-trodden road PR has followed for decades. Rather, we agreed to embrace change and become agents in a nascent revolution that was just then shaking the pillars of human communications. It was a wise choice, indeed, and one that now allows us to produce the quality of work that gains national recognition. Again, thanks to the entire Gregory FCA team. You never fail to surprise and delight. Now get back to work!